Iran's Revolutionary Guards say they have killed 11 Kurdish rebels in a clash close to the border with Iraq. Three Guards also died in the fighting, Iran's Fars news agency cited their commander in Kordestan province, Gen Mohammad Hossein Rajabi, as saying. Gen Rajabi said the rebels were linked to the Democratic Party of Iranian Kurdistan (PDKI). 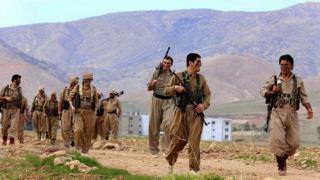 The PDKI said several of its fighters and more than 20 Iranian troops had been killed in clashes in recent days. The group has been striving for decades for autonomy for predominantly Kurdish areas in north-western Iran. Gen Rajabi told Fars that the 11-strong group of "counter-revolutionaries" were "eliminated" in the Sarvabad region by Revolutionary Guards. The rebels were pursued for 10 days before they were killed, he added. A PDKI commander called Kaveh Javanmard was among those killed, according to Brig Gen Mohammad Pakpour, the commander of the Guards' ground forces. It was not clear whether the 11 dead rebels included the five who the Guards said had been killed in clashes along the Iraqi border late on Saturday. The PDKI said its Peshmerga fighters had come under attack from Guards personnel on Saturday in the village of Dorow, near the town of Marivan. Two Peshmerga and a number of Guards were killed in the battle, it added. Other Peshmerga were ambushed later on Saturday in the mountains of Koslan, in the Marivan region, sparking clashes in which more Guards died, according to the PDKI. Further fighting on Sunday left scores of troops and a third Peshmerga dead, the group said. The PDKI added that Iranian forces had shelled several Kurdish border villages since Saturday. Gen Pakpour threatened on Sunday to launch cross-border raids on the PDKI. "Since the main bases of these terrorists are in northern Iraq, if they don't follow through with commitments to stop these attacks, their bases will be targeted where they are," he said. The estimated eight million Kurds in Iran, like other ethnic minorities, do not enjoy equal rights and the government consistently denies their right to use their languages in school, according to the US. However, President Hassan Rouhani promised to open Kurdish-language centres during a visit to Mahabad on 1 June. "The mother tongue of ethnic groups, especially of Kurds, should be respected and recognised," he said. Mahabad was the capital of a short-lived Kurdish republic that was founded after World War Two and lasted 11 months.